EPA, UFC and RCRA Secondary Containment requirements come from a variety of sources, with the main source being the Environmental Protection Agency. The EPA refers to the need for secondary containment in two different areas. Subpart J: Tank Systems (40 CFR 264.193), which covers large stationary containers, such as tank systems, for hazardous waste. Facilities that store hazardous materials may also be required to meet the either the UFC or IFC depending on what the locality has adopted. Throughout this document, the federal secondary containment requirements from the EPA will be listed along with the UFC and IFC standards. If there is any question regarding compliance, consult with a local fire marshal for more information. Run-on into the containment system must be prevented unless the collection system has sufficient excess capacity in addition to that required in paragraph (b)(3) of this section to contain any run-on which might enter the system. The containers are elevated or are otherwise protected form contact with accumulated liquid. There are certain wastes for which a storage area alone will not suffice. These waste streams are listed under 40 CFR part 264.175(d) and require a containment system in addition to the storage area. Provided with a leak-detection system that is designed and operated so that it will detect the failure of either the primary or secondary containment structure or the presence of any release of hazardous waste or accumulated liquid in the secondary containment system within 24 hours or at the earliest practicable time if the owner or operator can demonstrate to the regional administrator that existing detection technologies or site conditions will not allow detection of a release within 24 hours. Sloped or otherwise designed or operated to drain and remove liquids resulting from leaks, spills or precipitation. Spilled or leaked waste and accumulated precipitation must be removed from the secondary containment system within 24 hours, or in as timely a manner as possible to prevent harm to human health and the environment if the owner or operator can demonstrate to the regional administrator that removal of the released waste or accumulated precipitation cannot be accomplished within 24 hours. Designed or operated to contain 100% of the capacity of the larges tank within its boundary. Free of cracks or gaps. The UFC and IFC differs from the EPA because it states that the secondary containment for indoor storage areas must contain a spill from the largest vessel plus the flow volume of fire protection water calculated to discharge from the fire-extinguishing system over the area in which the storage is located for a period of 20 minutes. It also mentions that incompatible materials shall be separated from each other in secondary containment systems. The IFC mentions outdoor secondary storage areas that follow the EPA tank system design stating that they shall be designed to contain a spill from the largest individual vessel. If the area is open to rainfall, it shall be capable of containing the volume of a 24-hour rainfall as determined by a 25-year storm. The UFC does not mention outdoor storage areas. The IFC adds to this, stating the slope of floors shall not be less than 1%, drains for indoor storage areas shall be sized to carry the volume of the fire protection water as determined and drains for outdoor storage areas shall be sized to carry the volume of the fire flow and the volume of a 24-hour rainfall as determined by a 25-year storm. The UFC and IFC state that an approved method shall be provided to detect hazardous materials in the secondary containment system, but the IFC further mentions that a visual inspection is allowable and that detection for water in secondary containment systems must be provide if subject to water intrusion. Monitoring devices shall be connected to an approved visual or audible alarm. 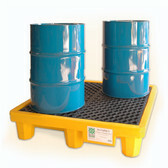 Containment system sups are primarily constructed of one or two materials: high-density polyethylene and steel. According to federal codes, a containment system must have a sufficient capacity to contain 10% of the volume of the containers or the volume of the largest container, whichever is greater. Some states may have more stringent restrictions and you should contact your local fire marshal for your local requirement. Most portable containment systems are constructed with fork pockets. These are designed to accept and be moved by forklifts. Special provisions need to be taken into account, such as grounding and bonding and the amount of flammable product being stored in one area. Check into local codes for these specifications. A listing of the regional EPA offices can be found after this section. Phone numbers of divisions that deal with secondary containment are listed. The regional office can refer to state EPA agencies that can explain state codes. Another source for secondary containment requirements is your local fire marshal. The following are some related terms as defined by the EPA and UFC. Container: Any portable device, in which a material is stored, transported, treated, disposed of or otherwise handled. Any vessel of 60 gallons (227L) or less capacity used for transporting or storing hazardous materials. Containment building: A hazardous waste management unit that is used to store or treat hazardous waste under the provisions of subpart DD of parts 264 or 265 of title 40. Leak-detection system: A system capable of detecting the failure of either the primary or secondary containment structure or the presence of a release of hazardous waste or accumulated liquid in the secondary containment structure. Such a system must employ operational controls (e.g., daily visual inspections for releases into the secondary containment system of aboveground tanks) or consist of an interstitial monitoring device designed to detect continuously and automatically the failure of the primary or secondary containment structure of the presence of a release of hazardous waste into the secondary containment structure. Liner: A continuous layer of natural or man-made materials, beneath or on the sides of a surface impoundment, landfill or landfill cell, which restricts the downward or lateral escape of hazardous waste, hazardous waste constituents or leachate. Portable tank: Any packaging over 60 gallons (227L) capacity and designed primarily to be loaded into, on or temporarily attached to a transport vehicle or ship and equipped with skids, mounting or accessories to facilitate handling or the tank by mechanical means. It does not include any cylinder having less than a 1000 lb. water capacity, cargo tank, tank car tank or trailers carrying cylinders of over 1000 lb. water capacity. Primary containment: The first level of containment, consisting of the inside portion of that container which comes into immediate contact on its inner surface with the material being contained. Secondary containment: That level of containment that is external to and separate from the primary containment. Stationary tank: Packaging designed primarily for stationary installations not intended for loading, unloading or attachment to a transport vehicle as part of its normal operation in the process of use. It does not include cylinders having less than 1000 lb. water capacity. Sump: Any pit or reservoir that meets the definition of a tank and those troughs/trenches connected to it that serve to collect hazardous waste for transport to hazardous waste storage, treatment or disposal facilities; except that as used in the landfill, surface impoundment and waste pile rules, sump: means any lined pit or reservoir that serves to collect liquids drained from a leachate collection and removal system or leak detection system for subsequent removal from the system. Note: The information contained in this publication is intended for general information purposes only. This publication is not a substitute for review of the applicable government regulations and standards, and should not be construed as legal advice or opinion. Readers with specific questions should refer to the cited regulation or consult with an attorney.